Rome, 2011. A German archaeologist and part-time tour guide accidentally stumbles upon the pope attending a Protestant church incognito and enters into a whirlwind of speculation: What does the pope’s hand do when he’s doing nothing? What might make his hand twitch? Is there such a thing as a papal slap, and if so to whom should it be administered? To the lecherous Italian Prime Minister? To a certain Libyan oil dictator as he curries favor with the Italian head of state with thirty Berber horses while at the same time attempting to convert all of Europe to Islam? And speaking of which, why did Saint Augustine have to bribe the Roman Emperor Honorius with eighty Numidian stallions to gain acceptance for the doctrine of original sin? Why do Germans long for Rome, even though―ever since the Teutonic invasions and the Nazi occupation―they have been considered the worst sort of barbarians there? Meanwhile, the narrator’s sister-in-law dreams of being pope, the pizza breath of noisy tourists wafts through the Sistine Chapel, and rats swarm about Via Veneto. Looking past the idealized Rome of picture postcards, the tour guide mentally roams through the city’s long history and extols the Italian art of saying yes and no at the same time. 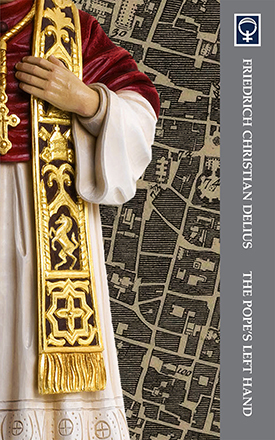 At once a timeless tale of Rome and the birth of a modern legend: how the pope became a Lutheran.